Picture this: freshly-cut colorful bouquets of flowers, outdoor dining tables dressed in black linens, empty wine glasses waiting to be filled with hand-crafted, award-winning wine, delectable freshly prepared local foods, brilliant blue skies perched above rows and rows of grape leaved vines, and the smell of fresh, pine-scented country air…sound too good to be true? Not so. I arrived at LaVelle Vineyards in Elmira at about 6:45pm for their Winemakers Dinner. After walking up the tiered, meticulously landscaped walkway towards the winery, I was greeted with a friendly smile and shown to my seat at one of several long dining tables that were neatly set-up in the grassy lawn just outside the winery and tasting room. I was told I could take my wine glass into the tasting room to sample some of the LaVelle wines, so without hesitation, I headed inside. Sunset Marshall, the Cellar Master at LaVelle Vineyards, suggested I sample something that we wouldn’t be drinking during dinner, so I chose the Gamay Noir. This dark purple wine was fruit forward with hints of raspberry and black currants, I sensed a tiny bit of tobacco and the finish was surprisingly spicy, which I personally loved. Gamay Noir is related to Pinot Noir, but is less difficult to manage and cultivate. It’s been around since the 15th century and is known to grow in abundant quantities, and although the grapes for LaVelle’s Gamay Noir were purchased from Walnut Ridge Vineyard in Junction City, I was pleased to later find out that the LaVelle’s have planted Gamay on their estate vineyard, so I look forward to future production. After savoring my sample of Gamay Noir, I headed back outside and took my seat. Doug LaVelle, owner of LaVelle Vineyards, introduced himself along with his son and co-owner of LaVelle, Matthew – Matthew is also the winemaker. Matthew introduced us to a busy group of people that were working diligently on getting our first course of a 4 course meal set up on plates and delivered to each diner. Field To Table Catering of Eugene was set up under a tent and assembling together a beautiful plate of Albacore Tuna Crudo with pickled chilis, lemon cucumber, fennel parsley salad, and grilled Meyer lemon. Albacore Tuna Crudo on it's way to the guests. Photo courtesy of Shaylor, Limelight Dept. Once I heard Field to Table was catering this event, I knew I was in for a treat. Owners of Field To Table, Nicole Peltz and Corey Wisum, created their catering business with a passion for local foods; their motto is: seasonally driven menus supporting local, organic, sustainably raised foods. They “cook from scratch and from the heart”, and it shows in their exquisitely and perfectly prepared ambrosial cuisine. The Albacore Tuna Crudo was carefully chosen to pair with the first glass pour – the 2010 Willamette Valley Pinot Gris: a dry, Alsatian-style Pinot Gris with tropical and citrus fruit notes. The grapes for this Pinot Gris were a combination of grapes from both LaVelle Vineyards and Walnut Ridge Vineyard in Junction City. Both lots were whole cluster pressed and fermented in stainless steel tanks. After fermentation, the wine was aged “Sur Lie” for four months to add complexity and depth of character. “Sur Lie” is French for meaning “afing on the lees,” and often referred to as “yeast contact.” Aging on the lees increases the complexity and creaminess of a wine, and this wine was most certainly complex and creamy: truly a flawless pairing. Albacore Tuna Crudo~Photo courtesy of Shaylor, Limelight Dept. As the second course was being prepared, the sun was beginning to set behind the giant fir trees that line the property to the west, and the sun’s rays beamed through the silhouetted trees like a blaze of fire. Just as I finished the savory Pinot Gris and Albacore Tuna, Matthew talked about the second wine we’d be drinking: the 2009 Columbia Valley Chardonnay. Just say the word, “Chardonnay”, and I immediately think of the sailboat I spent a summer on in my mid-twenties in the Bahamas named, “Chardonnay”: a 32 foot O’Day that I sailed from Nassau through the Southern Exuma Islands of the Bahamas. At that time, I loved California’s buttery, oaky Chardonnay’s, which I enjoyed with fresh caught seafood on a regular basis. Live aboard the good ship "Chardonnay"
So, the word Chardonnay immediately conjures up alluring memories of living the island life; I can almost taste Napa’s Far Niente Chardonnay in a glass tainted with salty sea spray. But, my love for buttery Chardonnay’s didn’t last past that summer as my tastes soon after desired lighter, dryer, and crisper white wines; in fact, I haven’t bought a bottle of California Chardonnay in years. When I first tried a stainless steel fermented Chardonnay in Oregon, I once again dove into the world of Chardonnay’s, but I felt that most lacked a certain depth of character. The 2009 Columbia Valley Chardonnay from LaVelle does not lack any character; stainless steel fermented and then lightly oaked in neutral oak barrels for 3 months, this Chardonnay is fruit forward and quite tropical with fresh pineapple and star fruit, along with tiny hints of oak. It’s fully well balanced with a crisp, refreshing finish that makes this the most palate pleasing Chardonnay I’ve had in years. Heirloom Tomato Panzanella~Photo courtesy of Shaylor, Limelight Dept. When our impeccably assembled plates of Heirloom Tomato Panzanella with mozzarella, basil, olive oil, aged balsamic, and croutons sprinkled with tiny purple flowers arrived, the pairing was unparalleled. The flavors melded together wholly and perfectly, and my curiosity of the tiny purple flowers which contained a familiar taste prompted me to investigate. Corey explained that they were the purple blooms on a chive, so the familiar taste was green onion, also known as chives. If you’re growing chives, don’t pick and toss the blooms; they’re edible, elegant, and enjoyable! purple chive blooms are beautifully edible. Dusk was upon us, and the sky went from orange along the horizon to midnight blue to pitch black. The third course was the entrée, and the grilling was in full swing. Field to Table was preparing our Rubbed and Grilled Hanger Steak with Roasted Corn Succotash and Herb Salsa Verde. The wine being served with the main course was LaVelle Vineyards 2008 Matthew’s Reserve Pinot Noir. If you’ve read any of my recent articles, you already know that I love the Matthew’s Reserve. Fruit forward with flavors of cherries and strawberries, this Pinot is extremely well balanced, silky smooth, and has a lasting, long finish with hints of vanilla and pie spice. Because it’s more complex and heavier in body than most Pinot Noir’s, this is a rare Pinot Noir and steak pairing that embraces flavors thoroughly and utterly well. As the sun was now completely gone, and our table was lit only by candlelight, I looked up and noticed the stars radiantly flickering against the darkened sky, and it seemed as though I could reach out and touch them. Rubbed & Grilled Hanger Steak~Photo courtesy of Shaylor, Limelight Dept. The last course of the evening was the Watermelon Mint Sorbet paired with LaVelle’s dessert wine, Autumn Nectar. Autumn Nectar is an Ice Riesling, or Ice Wine, which is produced from pressing grapes that have been partially frozen. The sugars in the fruit do not freeze, but the water does, so the juice that’s produced results in a smaller amount of more concentrated, very sweet wine. On the nose, Autumn Nectar explodes with aromas of peaches and nectarines, but on the palate, it’s light bodied with hints of lemon zest and honey. 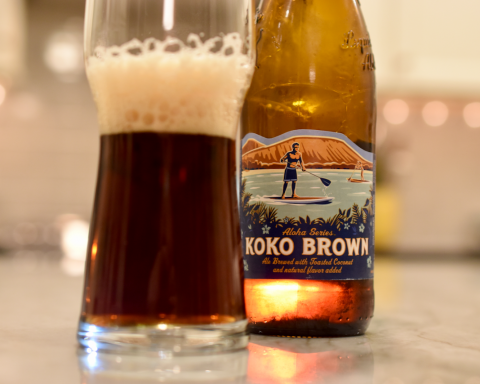 I was pleasantly surprised by its crispness, and really enjoyed the sweet and tangy flavors with the sorbet. There was a beautiful orange edible flower alongside the sorbet, which had a slight tartness to it that went well with the sweetness of the sorbet and wine: a perfectly sweet ending to an evening that seemed too good to be true. It’s times like this that remind me of the precious bounties I’m continuously rewarded with while simply residing in the beautiful southern Willamette Valley. We are sincerely blessed with the land and people that surround us. There’s nothing too good to be true in Oregon: Life Is Good.